Purified human complement Factor B. Factor B is one of the proteins unique to the Alternative Complement Pathway. The 93 kD Factor B protein is made up of a single peptide chain. When the alternative pathway is activated either directly or by the classical pathway via the amplification loop, C3b can bind whole Factor B. Factor D can then cleave Factor B in a single site to yield Ba and Bb. Bb can then become the enzymatically active constituent of the C3 and C5 alternative pathway convertases. All Quidel complement components are tested for functional activity in a standard lytic or applicable functional assay and for biochemical purity by SDS- polyacrylamide gel electrophoresis. Please refer to the Certificate of Analysis for lot specific information on functional titer. 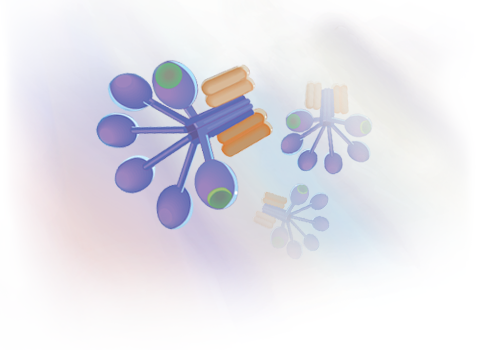 Quidel's purified human complement components are useful in a wide variety of immunochemical and research applications. For assistance with a specific protocol, please contact Quidel's Technical Assistance department. Marks, R., Hindmarsh, E. Complement activation occurs on subendothelial extracelluslar matrix in vitro and is initiated by retraction or removal of overlying endothelial cells, J Immunol 160:6128-6136, 1998. Janoff, E. Fasching, C. et al. Killing of Streptococuss pneumoniae by capsular polysaccharide-specific polymeric IgA complement and phagocytes, J. Clin Invest 104:1139-1147, 1999. Barbashov, S., Wang C., Nicholson-Weller, A. Serum amyloid P component forms a stable complex with human C5b-6, J. Immunol. 158:3830-3835, 1997.